Not responding to their name - A child should be receptive to his name at an early age (between 12 and 18 months). Meaning a parent or caregiver should not repeatedly call a child’s name to get his attention unless there is something very interesting going on that the child is focused on at the time. Objects are more interesting than people – A child should be more interested in how to gain reactions from others than an actual object itself. A lack of interest in people could mean a lack of interest in communicating. Not showing interest in books – Even if a child is not able to sit through an entire book, he should at least show an interest in the concept of reading. When given a book, he should demonstrate how to hold it and turn the pages. It is also important to note the types of books that interest a child. If a child shows more interest in picture books or books using one word, he could possibly have difficulty with processing auditory information. Difficulty with reading comprehension – If a child is unable to answer questions about a short story he may have a language delay and need the services of a speech-language pathologist. Difficulty having conversations and forming relationships with others – It is important to note that as a child gets older, conversations become more in-depth, which can become more difficult for a child with receptive language delays. Forgetting information – A child with receptive language delays may appear lazy or forgetful when it comes to completing instructed tasks. However, this child may be having difficulty with understanding and remembering the tasks presented to him. He may require the information be presented in a different way. Difficulty with following directions – Not only remembering what do to, but remembering in what order to do it can be hard for a child with receptive language delays. When presented with too much information, he might be overwhelmed and can show signs of copying others, pretending to know what to do when he doesn’t, or by acting out in order to avoid being embarrassed or calling attention to their deficit. Does not initiate conversations and reply to questions – This may also look like the child is just shy. It is important that this sign not be overlooked if there is a question about a possible delay. Talking in circles – A child should be able to tell a somewhat complete story by 6 or 7 with decent sequential order. If a child is unable to tell a story or it is unclear what the child is talking about, it may be a sign of an expressive language delay. Difficulty remembering certain names - This is when a child has difficulty remember names, places, and things. This may be more noticeable in an academic setting. Difficulty constructing sentences – Some examples of this include: the words may have no endings to show plurals (Five cat sleep), lack of possessives (Rachel dog is nice), or incorrect past tense verbs (She walk to the park yesterday). Some words may be left off a sentence completely. Please note by the age of four, a child should be able to complete full sentences with mostly proper grammar. 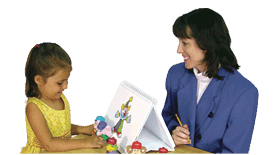 A speech-language pathologist (SLP) can help a child with receptive and expressive language delays. It is important to have your child tested as soon as possible if you suspect your child may have any delays. SLPs will work with you and other professionals to improve your child’s speech and language skills. Hamaguchi, Patricia M. (2010) Childhood Speech, Language, & Listening Problems Third Edition. Hoboken, New Jersey: John Wiley & Sons, Inc.